Ada soalan mengenai Sands Suites Resort & Spa? Terletak pada kedudukan yang baik di kawasan pantai di bandar Pulau Mauritius, Sands Suites Resort & Spa menyediakan tempat yang paling sesuai untuk anda berehat seketika dari kesibukan hari anda. Hotel ini tidak terlalu jauh dari pusat bandar: hanya sejauh 25.0 km, dan kebiasaanya mengambil masa kira-kira 60 minit untuk sampai di lapangan terbang. Dengan lokasi yang mudah, hotel ini memberikan akses mudah ke tempat yang anda perlu lawati di bandar. Sands Suites Resort & Spa juga menawarkan banyak kemudahan untuk memperkayakan penginapan anda di Pulau Mauritius. Ketika menginap di hartanah yang indah ini, para tetamu boleh menikmati Wi-Fi percuma semua bilik, meja depan 24 jam, fasiliti tetamu kurang upaya, simpanan bagasi, Wi-Fi di tempat awam. Masuklah ke salah satu dari 92 bilik tetamu kami dan tenangkan hati anda dengan pelbagai kemudahan seperti televisyen skrin rata, rak baju, kopi segera percuma, teh percuma, bilik persalinan yang boleh didapati di beberapa bilik terpilih. Hotel ini menawarkan kemudahan hebat, termasuk tab panas, pusat kecergasan, sauna, kolam renang terbuka, menyelam, untuk membantu anda berehat selepas hari yang penuh aksi di bandar. Apabila anda mencari penginapan yang selesa dan mudah di Pulau Mauritius, ijadikan Sands Suites Resort & Spa sebagai rumah anda seperti berada di rumah sebenar. For our first 3 days at Mauritius, we stayed at this hotel, and it turned out to be a very good choice! 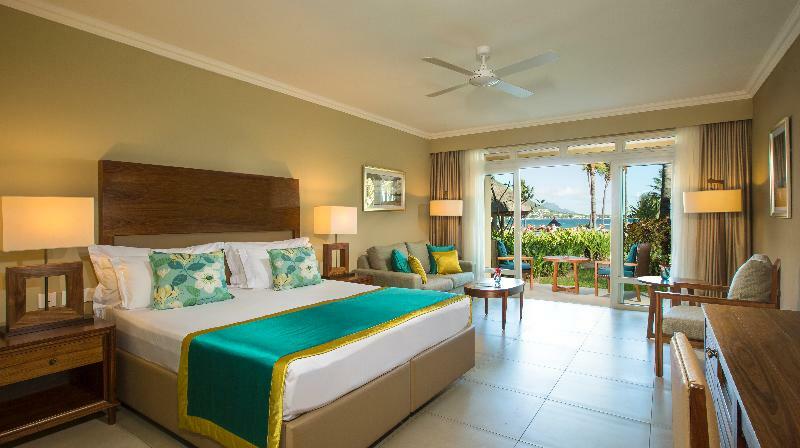 Very nice personnel, high quality of breakfast, private beach, and very spacious and clean room. Everything's perfect for this range of price! Just a little far from the main road, since this is the last hotel on this road after several hotels passed by from the beginning of the road. But no impact on the perfect experience! We stayed at Sands Suites Resort & Spa for 7 days, and we can't even tell how the time passed so quickly. You start your day with one of the awesomest breakfast that you'll every have and end your day with a delicious dinner buffet. The views are mesmerizing and you'll gaze the sky till wee hours! This is the place to be in Mauritius! Just go for it! As a returner to the sands Spa resort I was disappointed that the attention to detail which I had experienced on previous occasions was no longer the norm. The room was not cleaned as well as expected, nor the make up or turn down service. The tea coffee and sugar was not replenished consequently I had to call on most mornings. The gazebo romantic dinner was superb and the staffs are very helpful. The overall stay was memorable! We enjoyed our stay immensely. The staff were very friendly and accommodating. The hotel has fantastic facilities and beach activities. The breakfast and dinner spread was very varied and tasted phenomenal. Best stay for my trip in Mauritius. The staffs are so nice and made me feel very welcome. The view from the hotel is fantastic. The breakfast was very bad not even a fried rice or noodle.The staff was also very bad called up to ask you checked out.The overall of the resort is small and not much activity.Bad service and required card to take towels very troublesome food are overprice.The only things nice was the pool nothing more.I will surely recomend friends not to book sands resort at Mauritius.Please don try it if u saw my review.u will surely regret it. Staff, service, water and pool experience. Loved it. Will definitely come back here & its highly recommended resort with great facilities at a reasonable price. I love that they let the glass boat, snorkling, waterskiing & wakeboarding for free. Every staff is attentive to the needs of their guests & im impressed with the convenience of having a change room in the resort that i dont have to worry about leaving the resort after checkout time. you have to use and keep the paper card/coupons for beach towels.it's a bit troublesome.why not simply tell room numbers for towels? Truly a fantastic resort to stay in. The staff here was absolutely awesome. Extremely friendly and each guest is treated like a family member. The only down side was that the beach was quite stony. the difference between deluxe and superior suites just means which floor you're on:the ground floor, deluxe, and the rest, superior.Rooms are spacious, boathouse,great and lots of fun,staff,accomodating. However, the beach reaching under water is found not so friendly-too many pebbles there.restaurants along coastal road just aims at taking some more euros from tourists' pocket, so you have to drive into the town to find some 'regular' dinning places. The friendly staff made our stay brilliant. The biews were excellent and the water sport facilities were excellent. We enjoyed our break in Mauritius with Sands. The best things about the hotel has to be the professionalism of the staff and the super friendliness. They are brilliant. The water sport facilities were great (which hotel do you know gives you free paddle boarding and water skiing?). The view from the hotel is great as Tamarin moutain and Le Morne can be clearly seen from it. The buffet diners were good for a resort, and breakfats was great. Al;though we enjoyed our time there, some negatives stand out for us. We though that not providing guests with a bottle of water daily was a little on the cheap side. Also, depending on where the room is, the music at night goes on until 10:30pm and is very difficult to clear out if you are not in the mood for it. We thought the bands were good though.